The following four photo's are as seen on eBay in November 2011. 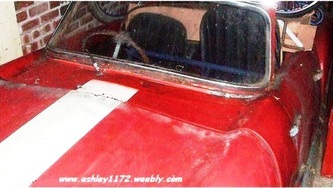 A very rare vintage Ashley 1172 Sportster Fiberglass car from 1959. The car has a Ford Sidevalve 1172cc engine. This car has been garaged since 1965, but the of the garage roof collapsed. So the car was exposed for many years in a rural area. The body is in very good condition, engine is in poor condition and interior is poor, the car needs a complete refurbishment. This would make a great Winter project. The photo's and eBay advert I collected during December 2012. 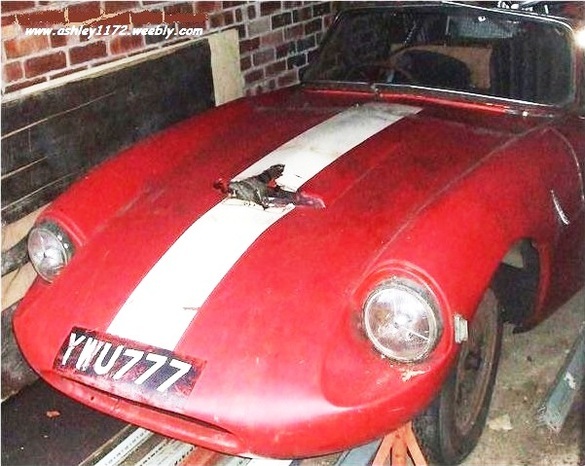 I have not been able to locate and follow the trail of the car but being finally sold for £3,433.00 I imagine that a total restoration was planned and undertaken. If the current owner or anyone that knows anything about this car, reads this webpage please email me with details of the car so that I can update it further, thanks. 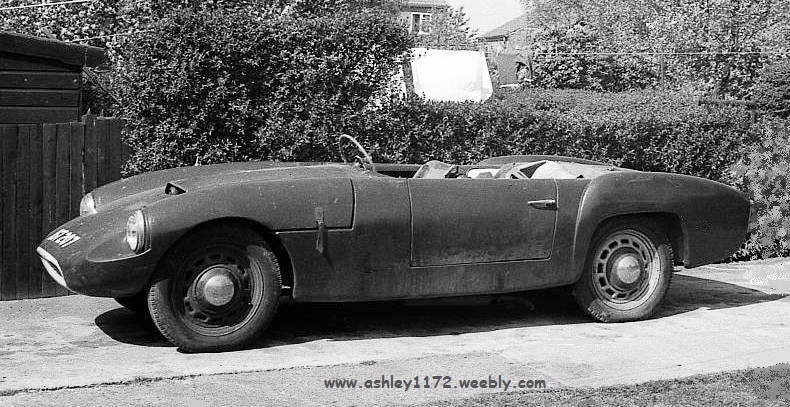 I now own YWU777, Ashley 1172 bodied sports car. It was built on a new Ford chassis in about 1959. I am the really the second owner as the car was registered to a man in Yorkshire after he built it and then used it. The car then was sold to a local man who never registered it. (I get the impression it was too much work for him). It was then sold to me along with the original log book and I have had a new V5 registration form issued. It will be a year or two before it hits the road again though. In the early 1960's I owned an Ashley 1172 on a 1939 Ford chassis, registration number AST107. It has long since been scrapped but I still have a few photographs of it. Photo's courtesy of Chris the new owner. Over the next week we swapped emails on a daily basis, with me asking questions and Chris sending more information and photo's about his new and old Ashley 1172's. 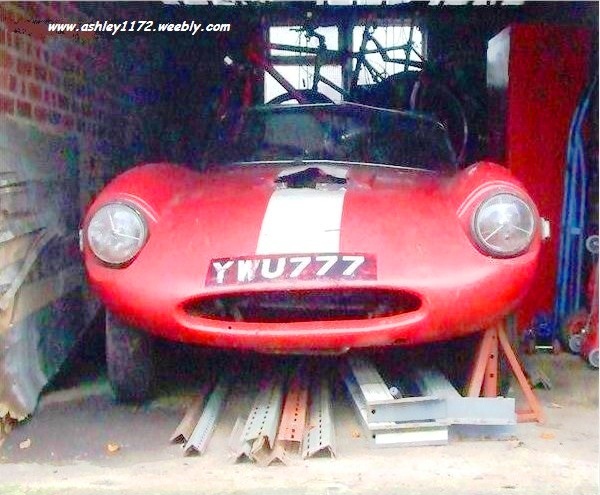 I know that the builder of the car (YWU777) was John Sutcliffe and the second owner was named John Lemon, but when the car was sold to him I don't know, but I have a feeling it was only a few months before I bought the car late in 2011. The car was built on a brand new chassis and was first registered 16-07-1959 at Yorkshire West Riding County Council, St. John's North, Wakefield. The chassis number is given on the original log book as 103E. The engine in the original log book is given as a 933cc engine with number E04A6015B but the engine that was fitted to the car when I bought it was a Ford 1172cc, engine number B148034C. The address for WYU777 when it was owned by John Sutcliffe was in Hebden Bridge, Yorkshire (I don't know if this is Johns original address as the log book that came with the car is a continuation). 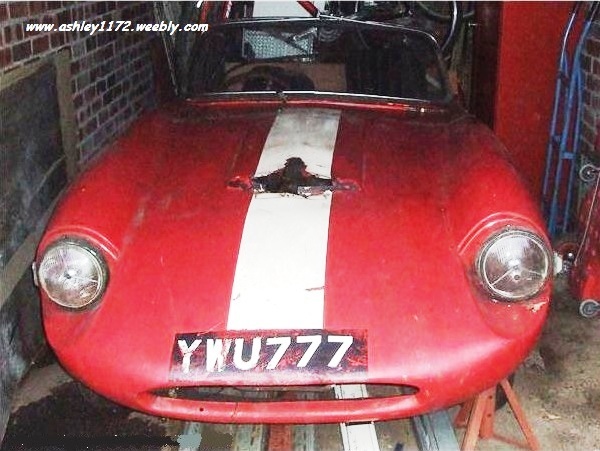 The car came fitted with a Triumph Spitfire windscreen and an Ashley one in a frame as a spare. The second owner lived in Todmorden, Yorkshire, just north of Rochdale and not too far from Hebden Bridge. Photo's courtesy of Chris the owner. Registration number AST207 and he still had photo's of it. This can be seen on it's own page Ashley 1172 - AST 207 on this website. The photo's I have attached are the first four taken when I collected the car. There are four more in the series which I send to you at a later date. As you can see from photo's the body shell is damaged round the boot and the boot lid is bowed inwards, nothing a bit of fibreglass won't fix and hopefully a hair drier will fix the boot lid. There is also some damage round the top of the bonnet and there is a break in the fibreglass to the right of the main air intake below and forward of the right hand headlight. The bulkhead is a mess and I intend to make a new one when the time is right and I am getting on with the rebuild but naturally the chassis and running gear will come first. I spoke to John Sutcliffe on the phone more than a year ago but he remembers little of when he built the car except to say that he thinks the 15" wheels were supplied by Ashley. 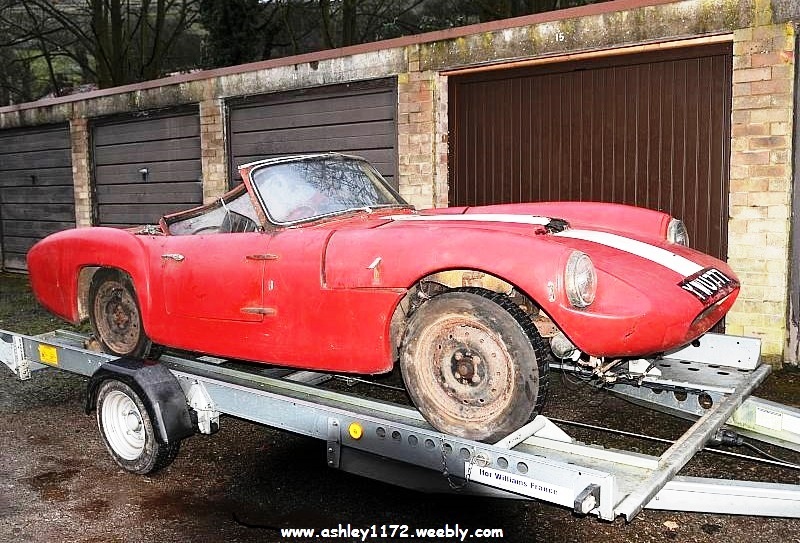 The car has hydraulic brakes and clutch and as so many of the fittings are Triumph Spitfire I suspect the brakes might be off the same car. He sent me a manifold for twin S.U. carburettors and a book called "The Ford 10 Tuning Manual", I think it's by D.H. Harris and John Dowdeswell. I expect to be in regular contact with Chris to keep this page upto date with all the progress as it gets restored, so keep watching.